Need an easy dessert recipe? Easy Sopapilla Bars are back and this time they taste even better! Yummy layers of crescent rolls, cream cheese and crunchy buttery sugar topping are busted with fresh blueberries. 5 minutes of prep time, 6 simple ingredients and the best Sopapilla Blueberry Cheesecake Bars you’ve ever tasted is ready! 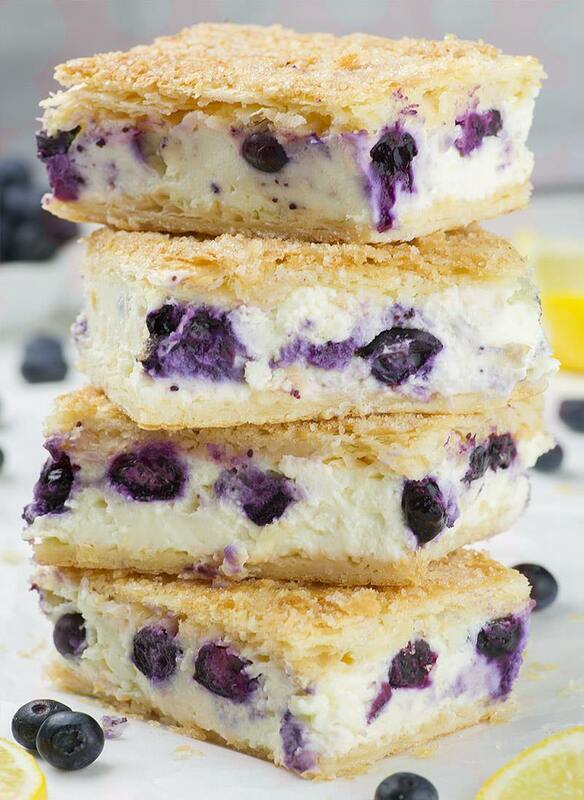 If you liked Sopapilla Cream Cheese Bars, you will totally be crazy for these Blueberry version. They are sweet and tangy, creamy and crunchy at the same time! A few years back, everybody became crazy for easy and simple twist on the popular Mexican pastry- Easy Sopapilla Bars. And I totally understand why that happened. I was crazed too! 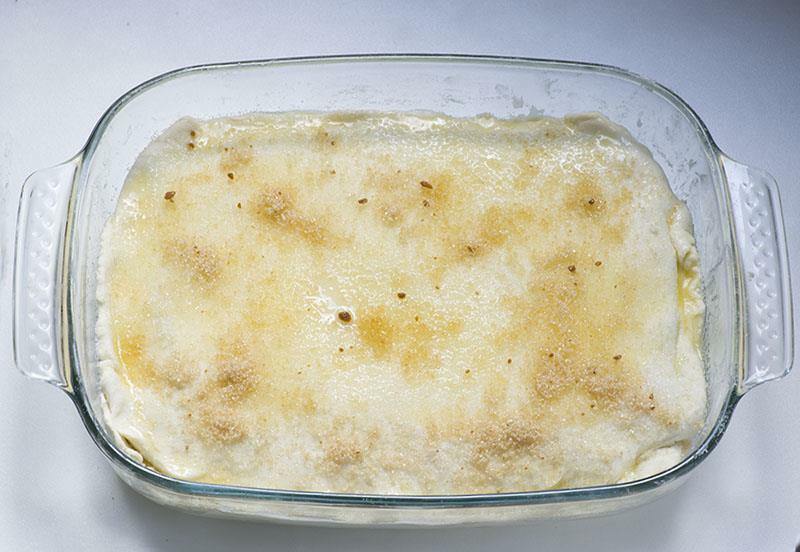 Easy Sopapilla Bars flooded the internet. Like many of my food blogger fellows, I also had to have it on my blog. If you missed it by any chance, then I have to remind you of my Just Ordinary Cheesecake Bars recipe. It’s still one of the most popular recipe on my blog after all these years! I mean, who wouldn’t like these Easy Sopapilla Bars or Cheesecake Bars, or whatever you named it?! You need just five minutes of active time for preparation. Unroll crescent rolls dough, starch it in the baking dish, spread cream cheese and sugar mixture, cover with another sheet of crescent roll dough, pour melted butter on top and sprinkle with sugar and they are ready to go in the oven for 20 to 30 minutes of baking. After one hour you can enjoy in the most amazing dessert. But I couldn’t stop just there. Although just a simple creamy cheesecake filling is a very good combo with crescent rolls and buttery sugar coated crust, I had to try some changes. Bowl full of fresh, juicy, ripe blueberries on my table was enough to inspire me to re-try my old recipe with a small but significant addition. 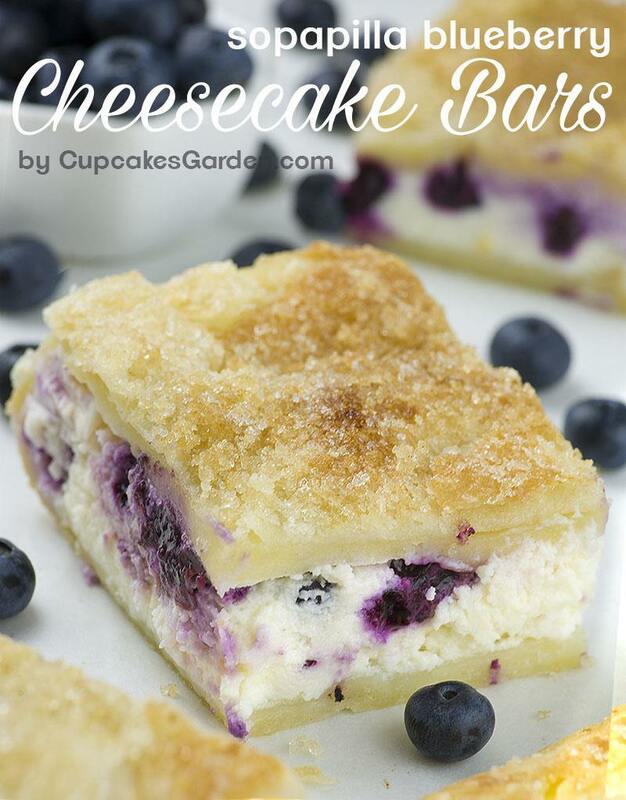 And that’s how these Blueberry Cheesecake Bars showed on my blog. Actually, I had to admit something. 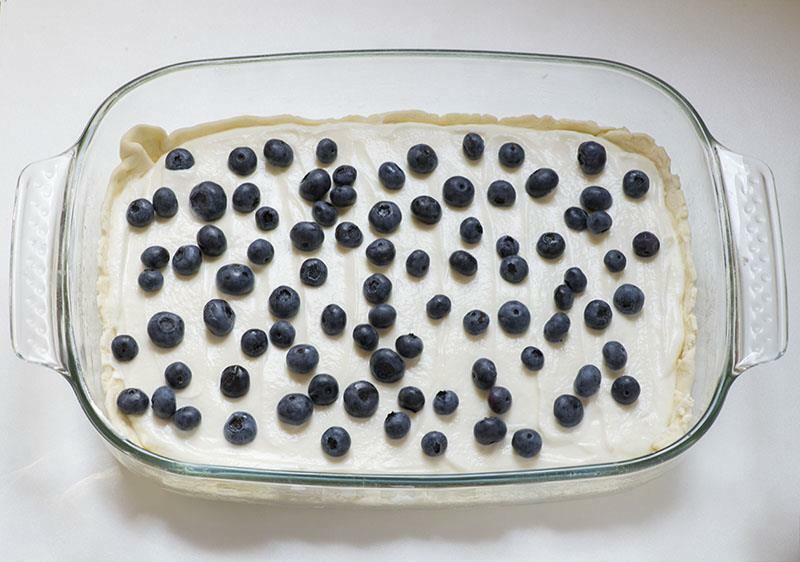 I baked these Sopapilla Blueberry Cheesecake Bars twice in one day. And that’s not because my first batch didn’t turn out OK. With this recipe there’s no failure. I took photos of step by step tutorial and let the baked bars cooling on the counter without warning my family that these yummy bars are new material for my blog. So I ended up with just a few bars left for shooting which wasn’t enough. To their luck, they got away unpunished because cream cheese and cans of crescent rolls are something I always have in stock so I could immediately start all over again. And fortunately these Sopapilla Blueberry Cheesecake Bars requires just 5 mins of prep time so I did not have too much to bother. As soon as you need quick and easy, tasty dessert, you must try this Sopapilla Blueberry Cheesecake Bars recipe! They taste amazing whether you eat them warm or cold! Need an easy dessert recipe? Easy Sopapilla Bars are back and this time they taste even better! Preheat the oven to 375F and spray 9×13 baking dish ( I used 9x11glass baking dish) with cooking spray, set aside. Unroll 1 can Crescent roll (or 1 sheet rolled puff pastry) and place at the bottom of baking dish, seal the perforation. 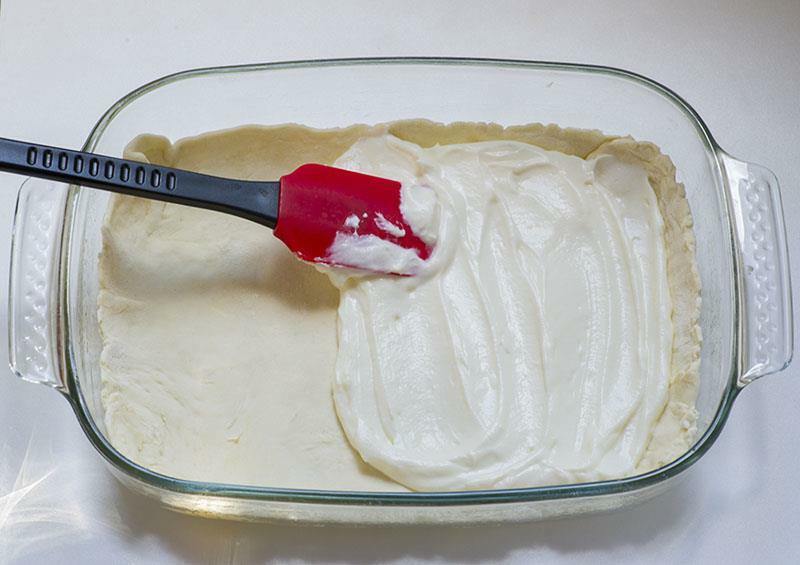 Mix softened cream cheese, sugar and vanilla until well combined and spread onto dough. Scatter fresh blueberries onto cream cheese. Unroll second can Crescent rolls and spread over filling and seal the edges and perforation. Cool at least 45-60 minutes to set before slicing and serving. I made these for a picnic yesterday and they were so good!!!! and easy!!!! Just like you said! My oven runs hot so I only had to bake them for 20 minutes. I cooled them for 15-20 minutes at room temp and was in a hurry so I threw it in the freezer for 45 minutes and then took it in the cooler to the picnic an hour away. They traveled well and were a hit! Several people asked for the recipe. Thank you for my new favorite recipe. Thanks Selby, I’m glad you liked it. Made these but added a 1/2 tsp of almond extract, used raspberries instead of blueberries and sprinkled the top with some almonds as well. Sooooo Yummy! At one point you mention that you baked these Easy Lemon Blueberry Cheesecake Bars twice in one day, but that was the only mention of lemon that I could find! Have you made a lemon version at some point? The idea intrigues me!